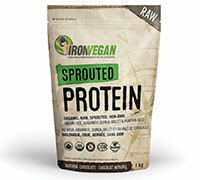 Each serving of Iron Vegan Sprouted Protein contains 17 grams of raw, plant-based protein derived from 5 organic Non-GMO sprouted grains and seeds. It also provides a complete profile of essential (all 9) and non-essential amino acids. 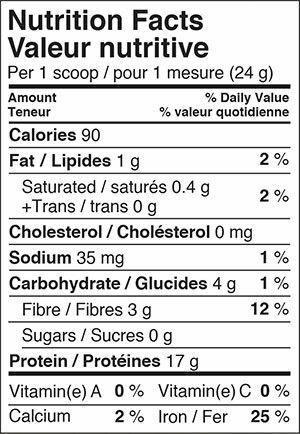 Ingredients: Organic Sprouted Brown Rice Protein, Organic Sprouted Quinoa, Organic Sprouted Amaranth, Organic Sprouted Millet, Organic Sprouted Pumpkin Seed, Organic Fair Trade Cocoa, Natural Chocolate Flavour, Apple Pectin, Xanthan Gum, Organic Stevia Leaf Extract.